Before I continue, just want to pause for a moment and send my condolences out to the Carson Wentz owners. Losing your starting MVP caliber QB right in the thick of the playoffs is a rough one. Hopefully, you had a good replacement on your bench, if not, my heart goes out to ya. Guess what though? We’re right in the thick of it folks. We’re in the playoffs! By now you shouldn’t have any guys on your roster you don’t feel comfortable having, so the start/sit decisions shouldn’t be that difficult this week, unless your teams are stacked. Take a deep breather though. You’ve made it this far, so there is no need to overthink things. As always, you play the best matchups and you play your studs, because, without them, you wouldn’t even be in the playoffs, right? One loss and your whole season is over with, so be sure to choose wisely! You’re obviously going to start your running backs who got you to the playoffs (Gurley, Mccoy, Kenyon Drake, Alex Collins, etc), and sit the guys who didn’t do much for you (Isaiah Crowell, Danny Woodhead, Latavius Murray, etc). 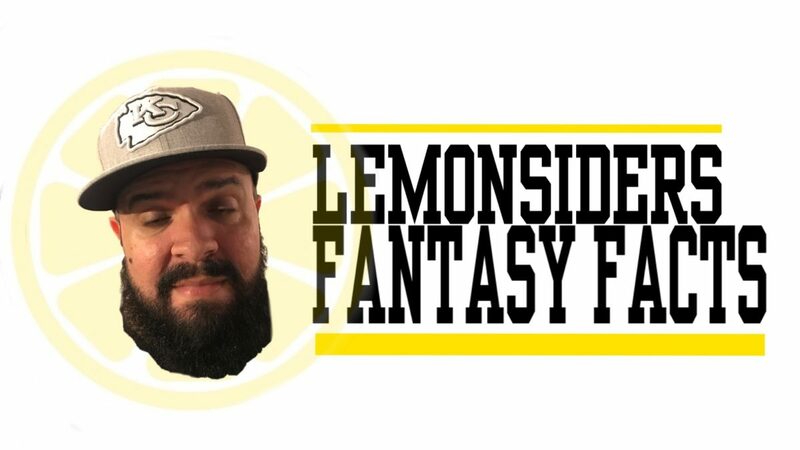 So, for this week, I’m going to do a special Lemonsiders Fantasy Facts edition which will be in a Swipe Left or Swipe Right style. These are players with good matchups (including some under the radar guys) I feel good about playing this week and players with bad matchups. Again, just because I, or even you don’t feel good about your matchup, and that’s your best player, PLAY HIM and don’t try to get cute with it. So if you lost Carson Wentz, the best thing you could have done if you didn’t have a QB on your bench already is pick up his back up. Yes, Nick Foles isn’t Carson Wentz but he does have a favorable matchup. Can’t feel as confident as having Wentz but he is playing those McAdoo-less Giants. I don’t feel good about Matt Ryan at all. I mean, how can you? I know the matchup is good, but he’s struggled over his career at Tampa, and he hasn’t provided a high ceiling all year. If you’re expecting 20+ points, it’s unlikely since he’s only done it twice this year. His last two starts haven’t even combined for 20 points! Not a horrible starter, but if this is the guy you’ve had all year, just continue rolling him out… I guess. The Oakland Raiders defense is so ugly they decided to make a commercial with a guy wearing an ugly Christmas sweater, fit with Christmas lights, of what team? Yeah, them Raiiiiddderrrs (Chris Berman voice). Opposing running backs have run through them like crazy shoppers run through doors on a Black Friday. Either one of these running backs is a good start, but how many touches they’ll get is unpredictable. However, I can see both scoring over 10 points, for sure. Cardinals run defense is actually pretty solid and despite the volume he’ll receive, I can’t see him scoring more than 15 points this week. I may have to start him in some of my leagues, but I don’t feel good about it. He hasn’t totaled 20 points combined the last two weeks against more favorable matchups, so I’m nervous about his production and points this week. So this is one of those matchups that are good but the scenario is bad. Kupp has been great the past few weeks but that’s because his target share went up with Robert Woods being out but now he’s back. Less targets = less production. It’s a great matchup but his ceiling and floor are now lowered so not too excited about him on the road against Seattle. Good matchup, bad scenario. 49ers have been pretty solid against tight ends throughout the year but not the last few weeks. This is a good matchup but a bit worrisome for me still because of Mariota’s inconsistent play. I do feel comfortable enough putting him here as a swipe right candidate though. T.J. Yates is the quarterback this week for the Texans, need I say more? Third-string QB against the Jaguars. Can’t feel good about any offensive player, especially at tight end for the Texans. Anderson was a hot pick up a few weeks back after a big game but yeah, don’t you dare play him this week. Aside from the obvious Jags against T.J. Yates, the Saints are my favorite matchup of the week. With McCown breaking his hand, here comes Bryce Petty. At home against a wounded Jets team, I can very easily see the Saints hitting 20 points for their DS/T. I apologize for always mentioning Chiefs on here. I’m not being a homer, I promise. It’s because people still talk about the Chiefs defense as if they are good. They really aren’t. Last week was a fluke game against a bad, bad team but this week it’s back to reality. Rivers has been on fire and I could very well see him continue this week. I loved him last week and I love him again. Jimmy G has thrown for over 600 yards in two games and in those games, Gould has hit 9 FG’s and has scored 15 points then 17. Yessir, start Gould cuz that matchup is great against a bad Titans defense. The opportunities will be there. If you have a kicker on a team who struggles to get points then you will have a kicker who will struggle to get YOU points too. Don’t expect much from the Texans offense so I sure as heck don’t expect much from their kicker and you shouldn’t either.